Zooplankton include microscopic animals, copepods, jellyfish, and larval crustaceans. Courtesy: University of Charleston, S.C.
Color: Various colors and shapes, mostly translucent. Size: Range in size from microscopic to jellyfish that grow upward of 8 feet. Habitat: Throughout the water column in both fresh and marine environments. Seasonal appearance: All year; numbers tend to increase in late spring and early fall. Zooplankton is the common name given to many small species of animals found in fresh and marine waters throughout the world. The word zooplankton, derived from Greek, means "wandering animals." They float in the water column and drift with the currents. Most of these animals are so minute they are visible only with a microscope, although some species can reach lengths of eight feet. Two general groups of zooplankton exist: those that remain planktonic throughout their entire life (holoplankton), and those that are larval stages of larger life forms (meroplankton). Jellyfish are the largest example of holoplankton. They remain in the planktonic zone for life and can grow as large as 8 feet, with tentacles up to 200 feet. Meroplankton are eggs and larvae of nearly all species of fish and benthic invertebrates. These creatures are planktonic during their developing stages and will eventually settle out of the planktonic zone as juveniles. 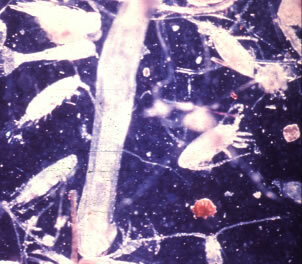 Of the numerous species, the most abundant and diverse are copepods. Copepods are crustaceans with a tough exoskeleton composed of calcium carbonate, and their bodies are divided into three sections: the head, thorax, and abdomen. Two antennae protrude from the head and aid in swimming, while two to four pairs of appendages extend from the thorax. Zooplankton migrate vertically in the water column each day, feeding on the phytoplankton, small floating plants such as algae, near the surface of the water. Zooplankton have adapted various mechanisms to float in the water column and protect themselves from predation. Some, such as larval crustaceans, have spikes that protect them and allow more surface area for better flotation. Some species of fish larvae have oil globules that give them added buoyancy. Zooplankton are a critical element in the food chain and are preyed upon by every filter-feeding organism in Rhode Island waters, including shellfish, fish, and whales. The baleen whales feed entirely on zooplankton, especially one species in particular called krill. Copepods and other zooplankton feed on phytoplankton and are the first link between the primary producers and larger animals. They are by far the most abundant group of animals in the world's oceans. Large numbers of zooplankton can be killed by increases in water temperature that are common near factory outfall pipes.